If you’re looking for a multi-use accessory that will act as a tabletop tripod as well as a versatile camera clamp, this could be the right choice for you. The 12-inch Flexible Tripod from Patekfly is a really nice option for those whose tripod needs span a lot of different applications. Whether you’re looking for a simple, versatile desktop tripod, an attachment for a camera on a bike or in a car, it’s a nice, sturdy flexible option. We spent a few days and half a dozen shoots around NYC with the tripod, using a combination of DSLR and mirrorless cameras, as well as our smartphone. Read on to see us break down the pros, cons and features. If you keep the three legs straight, the Patekfly 12looks just like any other pocket tripod. But the interesting features lies in the flexibility, and sleek black design of the unit. Most other flexible tripods on the market are either foam-wrapped or a series of multi-colored balls strung together. This one looks a bit like rubberized rope with rounded rubber balls on the end of each leg. Each of those flexible legs is about 12 inches long and about an inch thick. Each leg comes out of a small 2-inch disc that sports the Patekfly logo in subtle white. That’s about it, looks-wise, as it’s a pretty simple product. Check out our guide to using a tripod. Such a simple product might seem like it only affords simple uses, but because of its sturdy, flexible design, you can actually do a lot with it. As a tripod, it’s pretty reliable—Patekfly advertises a maximum weight capacity of approximately 1.8 pounds, but we actually found that it was able to hold a good deal more. That’s because the flexibility of the tripod disperses much of the weight, bolstered by the grippy rubber feet on the tripod legs. Our guess is you shouldn’t put a DSLR on this tripod if you plan to dangle it out a window horizontally because some connecting components are probably not tested for this use case. Another great feature on this tripod is that there’s a 360-degree articulating ball mount—surprising to see at the low price point, but very welcome for versatility in angle choices. Patekfly advertises a maximum weight capacity of approximately 1.8 pounds, but we actually found that it was able to hold a good deal more. Beyond the standard desk tripod use, we found the Patekfly 12 useful for plenty of other functions by virtue of the fact that the legs are flexible. You can actually bend the legs into fully binding loops that clamp onto a pole or edge. This means you can affix the tripod to your bike handlebars for a biking cam, the rearview mirror of your car, or even the leg of a chair, provided you use a small camera. Our favorite use is the ability to squeeze the three legs together into a straight pole and use it as an extended handle for a camera. Again, this is best for lighter devices like mirrorless cameras or GoPros, but it makes action shots much easier. Take a peek at our DSLR camera maintenance tips. The beauty of a tripod like this is obviously portability. At only 12 inches long, you should easily be able to fit it into a backpack or duffel bag. If you do choose to strap it outside your camera bag, it most likely won’t stick out at all. Amazon clocks the weight at 1.65 pounds, but our scales put this just a bit heavier (closer to 1.8 pounds or 800 grams). It’s a good deal heavier than we’d hope, considering the full-sized budget aluminum tripods tend to only weigh 3 to 4 pounds. The weight helps from a durability perspective (more on that next), but it does mean it’ll make your bag feel heavier. Finally, because the tripod bends, you should be able to compact it into a bag that wouldn’t otherwise accommodate the 12-inch length. Beyond the standard desk tripod use, we found this device particularly useful for all the extraneous functions you get by virtue of the fact that the legs are flexible. One of the key features of this bendable tripod is the material choice Patekfly made for the bendable legs. As we mentioned, many other flexible tripods opt for foam-coated wire or a series of articulating plastic balls. The Patekfly uses a really grippy, textured silicon that both felt sturdy and durable, but also provided some stability on surfaces. Because the bendable wire inside is so stiff, a lot of times the foam outer coating can tear when you try to force the legs into your desired shape. In this case, the silicon has enough give that we’re confident it will last through many bends. It was even hefty enough to easily grip our bike handlebars for a long, bumpy ride through the streets of New York, without any concern of it coming loose. If you’re using this tripod for your standard 0.25-inch screw interface, it will work great right out of the box. And if you’re hoping to use this tripod with your smartphone or GoPro, Patekfly has thrown in the necessary accessories there too—each with a 0.25-inch attachment for affixing them to the tripod. We found that the spring-action phone clamp was particularly sturdy and gave us no fears that our phone would come loose once clamped in. These attachments make this package even more of a great value. Interested in reading more reviews? Take a look at our selection of the best camera accessories. While there are some limitations due to the maximum weight and small stature, for the money you can’t go wrong. For a tiny tripod that’s intended for tabletop use—with the bonus features of being able to wrap itself around strange places for interesting vantage points—the Patekfly 12 sits right at the price point we’d expect. For approximately $20, you’ll get everything you need out of the box for action shots, quick desktop vlogging, and more. In fact, this is roughly the same price you’d pay for a single-use bike mount for your smartphone, and we found this option to be sturdier than many of the dedicated mounts in the price range. Take a peek at our guide to buying equipment for digital video production. Ubeesize Tripod S: This option comes in just a few bucks cheaper than the Patekfly, and with a notched foam material. We’re hesitant about its durability compared to an all-silicon construction. Joby GorillaPod 3K: This option is arguably the most well-known, and with really hard plastic and stiff bendability, it might give you a more substantial stand for larger cameras. But we still prefer the flexibility and grip of the Patekfly. Interested in reading more reviews? Take a look at our selection of the best tripods for DSLR cameras. 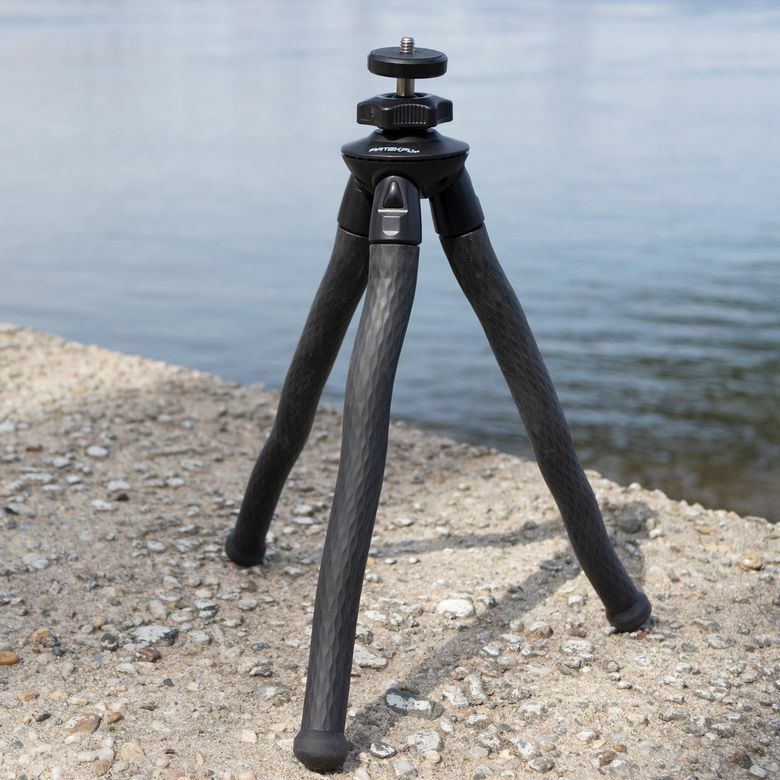 A flexible tripod for the action-oriented. Our testing gave us confidence in the durability, reliability and flexibility of the Patekfly 12. The silicon texture clung to surfaces with ease, while the tight inner bending wires gave us confidence in the tripod’s ability to hang on to even the most oddly placed surfaces. While there are some limitations due to the maximum weight and small stature, for the money you can’t go wrong. Product Dimensions 12 x 2.4 x 2.4 in.